Quality assurance uses various measuring machine concepts depending on the measurement task: for production monitoring, extremely fast machines are needed and high-precision multisensor coordinate measuring machines are required for work pieces with tight tolerances. For first article inspection, however, computed tomography that captures the work piece completely is desired. When first used in industrial applications, computed tomography was used only for non-destructive work piece testing for cracks, voids, or similar defects. In order to capture dimensions with sufficient accuracy, however, it had to be combined with coordinate measuring technology. 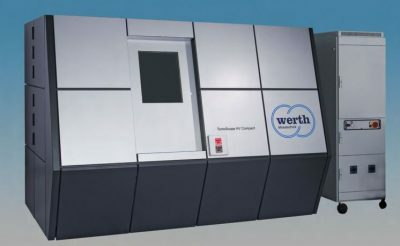 Werth Messtechnik GmbH, Giessen, had just presented the world’s first coordinate measuring machine with computed tomography in 2005 (with a multisensor system option) when a pilot project for implementing Werth X-ray tomography in dimensional metrology began at Julius Blum GmbH in Höchst (Vorarlberg, Austria). The end result of this project so far has been several CT machines, with various equipment levels, that are now indispensible for first article inspections at Blum. The latest machine has a 300 kV nanofocus X-ray tube and has allowed precision measurement of steel components since 2015. As seen in image above: Indispensable for first article inspection computed tomography: a TomoScope® HV Compact can capture the complete internal geometry of a work piece in a very short time.